as well as Velveteens and Linens and Wools to line sewing cases, back pin cushions... all sorts of fun things. 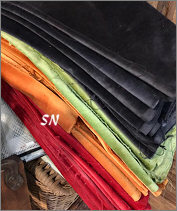 This is a gorgeous selection of hand-dyed cotton velveteen that is wonderful to use for pin cushion and pillow finishing. Offered in 10 x 18 cuts (each is torn instead of being cut) so you have the straight grain of the fabric. Good heavy hand, when you use crushed walnut shells or something heavy inside your smalls, you will really like the way this heavier finishing fabric feels. Lightweight calico is simply too thin. 16 yummy colors so far! 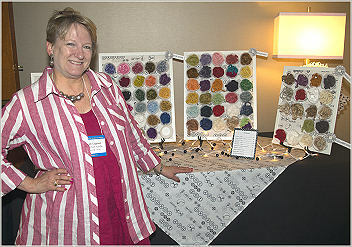 Lady Dot Creates has a beautiful new line of 18 luscious hand-dyed colors of baby-ball fringe trim! Offered in 2 yard cuts, it is GORGEOUS! Lois has some magical thing on her trim... it's like the pull-string of chain stitching on flour bags -- you pull the string and the 'extra' comes off leaving you a string of baby balls that you can simply tack onto your piece without having to sew it into a seam!!! This requires less planning! You can make your little cushion and THEN add the trim -- not having to fight with attaching it during the finishing. Anyway... 18 luscious colors, they follow the same shades as the chenille - VERY pretty colors!! Presented in continous 2-yard lengths. Wow... I bet Lady Dot's Lois is in BIG trouble with her mom -- this gorgeous new chenille probably came from the family heirloom bedspread!!! It is a new line of plump, fuzzy, super-soft hand-dyed cotton chenille -- the kind you find on the charming antique bedspreads. Lady Dot has dyed a wonderful array of colors -- the names are delightful and descriptive -- and you'll love how well it covers the edges of your pin cushions and needlework smalls. 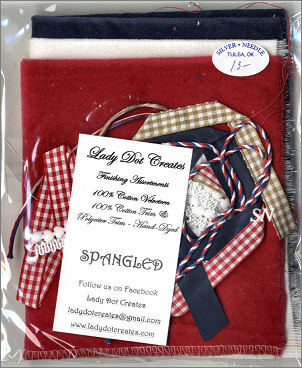 Packaged in 3-yard lengths... we just love it ALL! Since no two computers see colors exactly the same, we are giving you a close-to-but-not-exact DMC thread number by each package. Please remember, these are only estimates to give you a general idea. You can't hold us, or Lady Dot, to those numbers, because in dyeing, just as in computing, nothing is totally consistent. 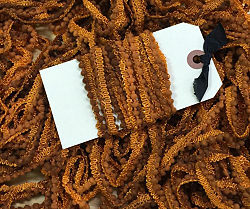 We have a new style of hand-dyed trim by Lady Dot Creates -- it's 100% cotton, and looks like a fern frond! It's Eyelash -- a thin strand with little 1/4 inch long 'frizzies' coming out from it. I think you could make darling rabbit tails -- use several strands like a tassel fringe. Dyed to match Lady Dot's existing colors, we have six of her most popular colors so far. Algae is a soft green, Licorice -- a dark gray to soft black, Sizzle -- that gorgeous rich red, Snow -- white. 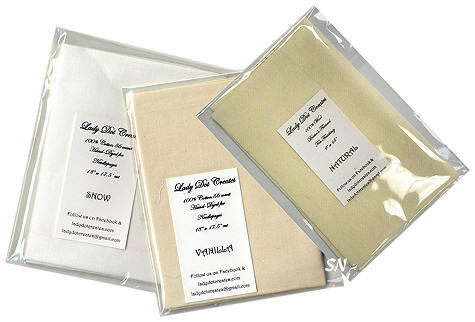 Then we have Vanilla which is a cream and finally Vintage which is ivory and taupe and simply goes with everything!!!!!!!! Packaged in 9 yard lengths. 9/16 of an inch wide and three yards in length, this soft, shiny ribbon is gorgeous! The solid colors are basically solid -- not blotchy -- just an ever-so-slight color variation here and there. Vintage is the color with the most variation. We use this product to 'rouche' around cushions and ornaments. You'll see it twisted and looped while being anchored with beads -- Shepherd's bush and JBW show a lot of finishing with this treatment, and our Mona uses this technique a lot in her finishing as well. Very soft and easy to work with. You can sew rik-rak right into your seam or tack it on with more of the glass beads. Offered in 3-yard lengths. Here are 4 new collections of hand-dyed Velveteens with coordinating/contrasting/matching trims - all prefect to finish all your various pincushions, fobs, sewing cases -- all your 'smalls.' Really nice, especially if you are finishing a couple of matching designs, you get three velveteens measuring about 8-1/2 x 11, along with 24-inch lengths of 4 more assorted trims to go with them. 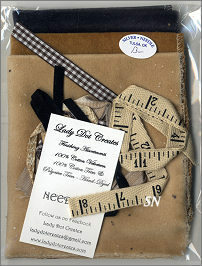 Each has a hand-dyed Lady Dot trim in there (baby balls in Cauldron... and there are matching pins, shown below; and I see Lois's hand-dyed tape measure ribbon - which we offer in 3-yard packs all by itself as well - in the Needfuls packet.) Cute checkered ribbons... just fun things for backs, edges and hanger loops. 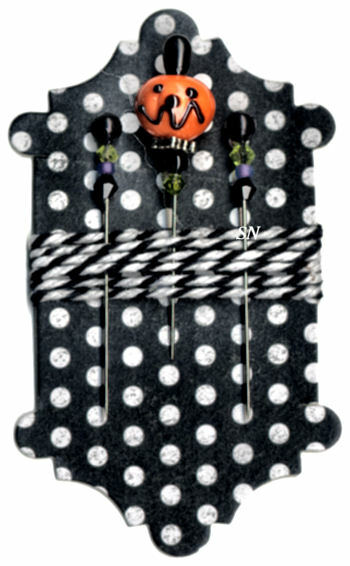 A charming set of this edging cord and that awesome glass jack-o-lantern pin - this is a mini-finishing pack for a Halloween small! If you get the Cauldron Finishing Pack above... get this too! The pumpkin is a hand-made Lampwork glass bead, while the other two feature complimentary green and purple beads. Just fun! Lady Dot is now offering cuts of hand-dyed 56ct cotton that is wonderful to use for needle pages inside your needle and sewing cases! The pieces measure about 17-1/2 x 18 and come in a vanilla (cream) color or snow (white.) You want these because the material is heavy and substantial -- not see-through and sheer -- and your needles will be very happy and safe poked into it. Not to mention how perfectly straight it is, and how nice it will look inside your things! Doctor's Flannel is also new. It is 100% wool, a yellower *natural* color. These cuts are 9 x 15... something else dreamy to line your stitched pieces!!!!! Here is a pair of what-nots just for fun by Lady Dot. 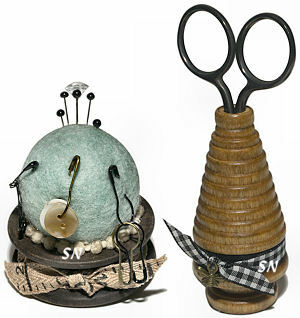 The Pulley features a felted wool pin cushion ball (assorted colors) decorated with old fashioned safety pins and a couple of old buttons. It has hand-dyed tape measure twill tape wrapped around its squatty wooden base. Overall, it measures about 2 x 2. It does nothing except look cute and hold a few more pins and needles! No assembly necessary. The Scissor Hive is now sold out.